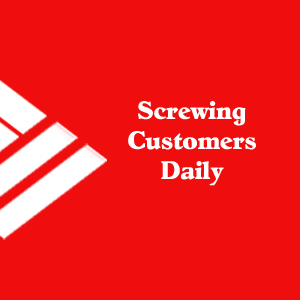 The last few days, I’ve been fussing pretty hard about Bank of America (BofA). I’ve found a lot of people are reluctant to change banks, simply because it’s a huge hassle. For me, it took less than an hour of my time (20 minute drive to the bank, 10-15 visit to close the account and fuss, and a 20 minute drive back home) on Friday. I decided to open an account at another bank. This was quite some time ago, actually. So I already had a bank I could go to before I closed my BofA account. Over the months, I’d gradually changed my automatic drafts and bill pay to the other accounts. By the time I walked in on Friday, I only had one payment coming out of the BofA account. I kept a very small balance (less than $100) just so I wouldn’t get dinged a overdraft charge with my peddle $4.99 monthly bill. I admit… it’s a little unfair of me to expect everyone to close their accounts immediately, because I’m pissed the hell off at BofA. Some folks don’t have a problem with the monster mega bank. That’s fine. Keep on rolling with what works for you. 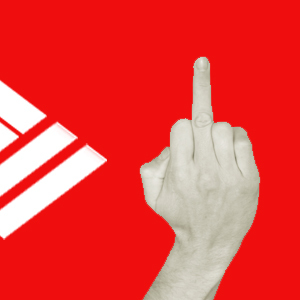 For those who aren’t happy with the way BofA has treated you, do something about it. It doesn’t have to be tomorrow. Like I said, I’d had quite some time to prepare. Here’s what you can do. Tomorrow is Monday. Open a new account at a friendly bank. If there are no lines, you’re looking at a 30 minute visit — a lunch break. Then take the time you need (a month or two) to transfer your automatic drafts and such over to your new bank. A couple of months will give you the time to make sure you didn’t miss any of those bills, and also beat the $5 debit fee BofA has planned for you and the other charges you know they have stewing in their sadist heads. Here’s the thing, my buddies. If you don’t set an example now, two things will happen. 1) It will validate the bad treatment BofA has given you in the past. They’ve been naughty… and not just with the $5 upcoming fee. They will only continue to get worse, because you as a customer tell them with your money you don’t care how bad they treat you. 2) Other banks will take it as a sign that fees like this are acceptable. So when you finally get fed up with BofA and their crappy no-customer service, you won’t have anywhere to turn, because the other banks will be just as bad. So, I’m going to tell you how I switched banks, and maybe you’ll realize it’s not that difficult with a little planning. Step 1: Open an account at a small community bank or credit union. Typically small banks and credit unions give you the best deals. Also, credit unions are member owned and controlled. When the credit union thrives, so do you. Though not a small community bank, I like USAA. When I became a customer of USAA, they had a few rules to qualify (like having a connection with the military). Not sure if that’s true today, but it’s an excellent bank which I highly recommend. Though it’s technically a bank, the benefits are on par with a credit union (at least in my opinion). Make sure you put some money in your new account. Step 2: Stop using your old bank (BofA) and start using your new bank. You want to make sure all the checks and transactions have cleared the old bank before you close it. I was told BofA will reopen your account if a transaction comes in. Grrr! That means if you have a $0 balance, you’ll likely get charged fees if you use your account for purchases or checks. This will also give you an opportunity to see what exactly is coming out of your account. You don’t want to miss any charges which happen on the merchant end, like automatically payments setup through a department store rather than bill pay or a bank draft for your karate lessons. Step 3: Move your direct deposit to your new bank. No sense in letting BofA use your money. Bofa — worst of the worst in banking with BP as the only company in America being worse. Bank of America… that’s a joke. Step 4: Change your automatic drafts to your new bank. Make sure you not only change the ones on your bill pay, but also the ones I mentioned from Step 2 — stuff drafted by retailers and services. This step might take the longest, which is why I say a month or two. You don’t want to miss ANYTHING, because you KNOW BofA will try to squeeze those last few $$ out of your pocket in whatever kind of fee they can manage. Step 5: Give Bofa the finger and close your old account! I wish you all the best removing BofA’s boot from your neck. You need to check out my friend, SE Day’s website and radio show, The Legally Steal Show–it’s exactly what you’re talking about with your article here and he’s actually a HUGE credit union and financial consumer advocate who’s trying to spread the word about how to take a stand and protecting the interests of the middle and working class people who work hard for their dollars and watch every penny. Would you mind if I forwarded him your piece? His website is http://www.legallysteal.com and blogs are on http://www.blogtalkradio.com/legallystealshow. He’s also on Facebook and Twitter. Anyway, I think he’d love to read your article, which is why I wanted your permission to share it. Let me know if you need more info or have questions. I would love for you to spread the word, Rachel. I pulled up the two sites on my web browser, so I can check him out after dinner. Thanks for the resource.